Tingling in arms and hands demands one must pay attention. Tingling in arms and hands is the most common complaint at the chiropractic coalface, after lower back pain. This page was updated by Dr Barrie Lewis on 13th October, 2018. This is a long and important page. Pour a strong cup of tea, and get comfortable. Tingling is primarily a sign of nerve irritation or damage. That could be in the brain or spinal cord, but more usually it is in the neck, or trapped between the first rib and clavicle. Some times that problem may be somewhere in the upper extremity, for example at the funny bone, or in the forearm by the two bellies of the pronator teres muscle as occurs in the carpal tunnel syndrome. Take special note of which fingers are tingling; is it in the tongue also? Or are you feeling the paresthesias, as they are known, around your lips? Do movements of the neck provoke the pain in the upper limb? What about raising your arms in the air; does that increase or relieve the tingling? Tingling in arms and hands, as a general rule of thumb, sorry to be puny, is not something for which your doctor or chiropractor are likely to recommend you rush off and make a consultation. Having said that, an unknown symptom never experienced before needs to be taken more seriously. Is it radiating down the left arm; are you sweating and nauseous? Get to the emergency room fast; a heart attack may be lurking. However, neurological symptoms like tingling need to be attended to with greater concern. The neurological system is the most sensitive structure in the body, and early warnings are best heeded sooner rather than later. A young friend recently had a totally unexpected stroke, and is permanently blind in one eye. Why didn't you come sooner, complained the neurologist. For six weeks he had been getting warning tingling signs. Tingling in arms and hands explains why neurological symptoms should be attended to with greater concern. It's a hard decision; when must you rush off to the doctor or chiropractor, and when can you safely see if this too won't pass of itself? Inner wisdom is needed. When in doubt err on the side of too early than too late. The situation needs also be assessed wisely. If you are healthy, and you wake up with tingling in your arm, I suggest you ignore it! But if you have a known heart condition, and the tingling is in your left arm, then obviously you shouldn't ignore it. Likewise, if you have had a temporary ischemic attack before, or have high blood pressure or diabetes, then tingling should be considered in a most serious light. For you, on a chiropractic website, more important is that, should you have had pain in your neck, or back, for that matter, for several days and now tingling in your arm or leg begins, then it is of the utmost importance that you immediately consult your chiropractor. First, take note of what relieves and aggravates the tingling and pain. Does looking up hurt? Where does it hurt? In the neck only? Or, in the pinkie also? Does turning your head and then simutaneously looking up hurt? Again, where does it hurt? What does stretching out your arm do? And putting your hand on your head? Do coughing and sneezing hurt? Dermatomes are patches of skin belong to a specific nerve root. A dermatomal pattern occurs when one of them is irritated in the neck, giving far more specific tingling, or pain, in the arm. 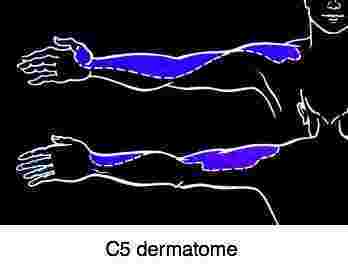 For example, in the C5 dermatome the tingling is felt on the side of the upper arm, and perhaps the side of the lower extremity, on the radial side but not stretching as far as the thumb; it belongs to the C6 nerve root. Sometimes you may have tingling in arms and hands, bilaterally, but that is more typical of another condition. If the irritation of the nerve root as it emerges from the intervertebral foramen affects the motor component, then you will be prone to tennis elbow, or weakened biceps and deltoid muscles, for example; that means shoulder pain. The biceps reflex is used as a test of the integrity of the fifth cervical nerve root. It may be reduced, or even absent. You may be asked to clench your teeth as it is being tested. An increased reflex is cause for greater concern; it's known as an upper motor neuron sign pointing to the spinal cord or brain. In the early stages of an irritated nerve in the neck, the skin becomes hypersensitive; meaning increased prickling when tested with the pinwheel. Should you rub your arm, or try stabbing it lightly with a needle, and it has an irritating feel but later, if you ignore the tingling, the feeling in your fingers will lessen and then become numb. New research has demonstrated that the cartilage in the small joints in the neck, in fact any joint cartilage in the body, is dependent on movement for its proper nutrition. Fixations within these joints starve the cartilage of oxygen and nutrients, and cause the build up of noxious waste products. These chemicals may themselves irritate the nerve roots, and causing tingling in the arm. However, it is often then of a more diffuse nature. Arthritic changes within the foramen where the nerve emerges is another cause of tingling and pain in the arm. It occurs after a poorly managed whiplash, damaging the tiny joints of Luschka. It could also be caused by a slipped disk in your neck, or arthritic changes in the facet joints. In fact the nerve root is vulnerable from all sides in the intervertebral foramen. Injury is certainly not uncommon and the pain may be severe. Classically you may have pain in the lower arm and tingling in fingers one and two, the thumb and forefinger. In more serious cases the tingling is associated with a deep, numbing ache in arm, often worse at night. Tip: Try sleeping with your hand under your head, or under the pillow. 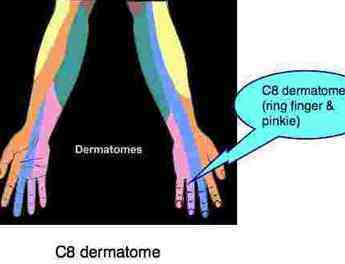 The C7 and C8 nerves emerge from the lower neck, and will cause tingling in the middle finger, C7, and the ring and little finger, C8 dermatome. The most common muscle affected in a neck condition is the triceps, an elbow extensor, usually when the nerve root is severely irritated. Doing press-ups will be difficult - that arm will tire very quickly. The Triceps is innervated primarily by C6-C7-C8 nerve roots. Carpal Tunnel Syndrome never affects the pinkie, an important diagnostic point. However, Cervical ribs and the First Rib syndrome (part of the so-called Thoracic Outlet Syndrome) will often cause tingling in the ring finger and pinkie, which is NOT from the spine per se. Adson's test makes the diagnosis. 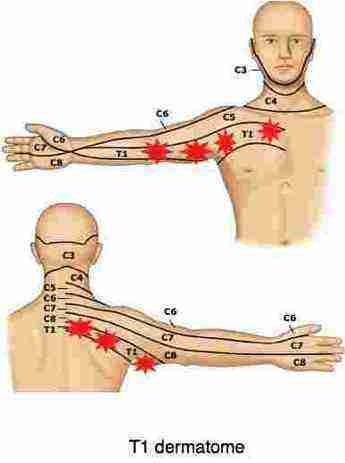 Thoracic outlet syndrome produces tingling in arms and hands, but often in a non-dermatomal pattern. The "thoracic outlet" is made up of a space behind the clavicle (collarbone) and above the first rib which is shown but not labelled above. Through this space three important structures pass on their way to the arm. Two of these structures, the brachial plexus and the subclavian artery, but not the vein, first escape from the chest cavity via a narrow triangle known as the "inter scalene triangle". More about that subluxated first rib. Can you spy it with the brachial plexus and the subclavian artery and vein resting immediately on it? It's a not uncommon cause of pain and tingling in arms and hands. 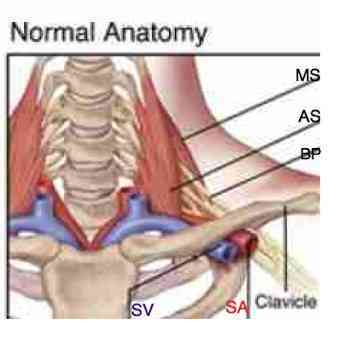 The condition is called a Thoracic Outlet Syndrome (TOS) in which the artery and or nerve bundle may be pinched either in the inter scalene triangle or in the space below and behind the collarbone. The tingling is usually of a diffuse nature, rather than to one particular part of the arm, known as a dermatomal pattern. Working with your hands above your shoulders as in hanging washing is immediately very fatiguing as both blood and nerve supply are limited. 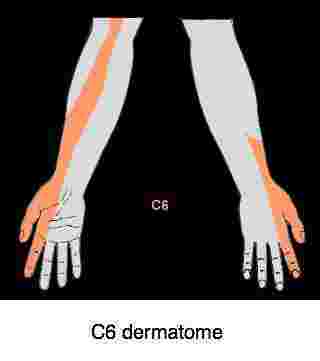 In other words, not just in one single dermatome, like your thumb and forefinger, the C6 dermatome, for example. 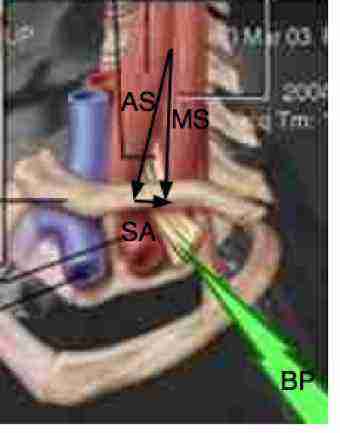 Adson's test confirms the the tingling comes from an irritation within the Inter Scalene Triangle rather than a nerve root impingement. See the video at Adson's test but this is not a test to be done at home. It requires a great deal of experience to interpret the results. Lesions of the T1 dermatome often cause pain in the upper midback - around the shoulder blade, sometimes to the front of the chest, and down the inner upper arm. Deep upper back pain. Tingling in arms and hands is not the only sensation that may be caused. You may also have numbness, weakness and arm pain. The pain is of a deep aching nature, and can be very severe, and is often worst at night. Placing your arm on your head, the so called Shoulder Abduction Relief sign, or making a windmill motion with your arm may relieve the tingling in arms and hands. For more information about neck pain anatomy or the affect of neck pain and tingling in the arm on society, click on these links. If you are eager to know about chiropractic treatment of tingling in arms and hands, click here: neck pain treatment. You will notice there are variations in various dermatomal atlases. 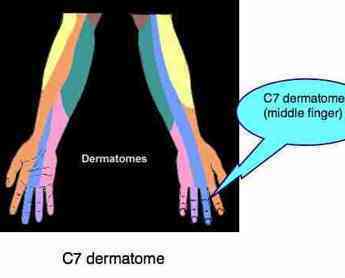 Some for example place the index finger in the C7 dermatome. More usually the index finger belongs to C6. The definitive test for a pinched nerve in the neck is the upper limb tension test which places increasing stretch on the nerve roots. You can do this test at home to see if think you may have a pinched nerve, follow the link to YouTube. After a test called Spurlings (which I don't recommend you do at home as it can increase the pain and tingling in arms and hands) the ULTT is probably the most commonly used test in my clinic, and you can test yourself. But if you want to know more about it, here's Spurling's test. If it's positive, you're in trouble and need to see your chiropractor sooner rather than later; and don't expect Rome to be built in a day. Tingling and pain in the arms and hands raises a great deal of anxiety and concern. You can submit questions via Chiropractic Help Questions forum lower down. Tingling in the finger tips and toes, and around the lips, coupled with anxiety and fatigue, and muscle cramps are signs of a fairly rare condition called Hypoparathryoidism. It's also a serious cause of osteoporosis. Stiff joints in the neck are probably the most common cause of tingling in arms and hands. These are the result of an injury (for example Whiplash Chiropractic ...) or an improper movement or position. We are often consulted my people with neck pain after sleeping in the upright position for example, or having a child sitting astride the neck. For more about joint fixations, or subluxations as we chiropractors call them. Chiropractic subluxation. Google appears to frown on too many links, so phrases in bold, like that chiropractic subluxation above, need to be put into the Site Search function in the navigation bar on your left if you want more information. Carpal tunnel syndrome is another fairly common cause of tingling in arms and hands, affecting the median nerve. It usually starts in the thumb, index and middle finger, sometimes the ring finger but NEVER into the pinkie. It may extend into the arm, and then the other arm. It's always wise to simply start with these Carpal Tunnel exercises if there's merely tingling in the lower arm and hand. Pronator teres syndrome mimics the carpal tunnel causing severe pain radiating down the lower arm to the fingers of the median nerve distribution. Tingling in feet and legs is synonymous with the tingling in arms and hands only the entrapment is in the lumbar spine and pelvis. Sacroiliac Joint syndrome could have a similar effect, with tingling and pain, and possibly weakness in the legs and feet. The most common sciatica refers to the outside of the foot and the small toe. If there is weakness you will have difficulty standing on one foot and raising your heel or great toe from the ground. For more about tingling in feet and legs follow this link. 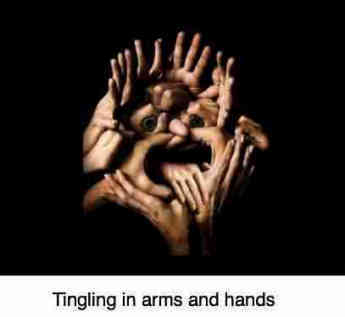 Multiple sclerosis, better known as MS, also produces tingling in arms and hands and also often affects the eyes. Researchers at the university of Canberra, Australia, reported in the medical journal Neurology, February 8, 2011, have found two things, tested independently, to help prevent multiple sclerosis. It's a serious neurological disease in which the nerves are stripped of their fatty covering, known as the myelin sheath. Then the nerves won't conduct and so sensory and motor disturbances are experienced, often starting in the eyes. Eating the right fats, and just as important the right ratio of omega 6 to 3, is vital in the body. In short, more fruit oils from the olive and avocado and less from seeds, particularly those that are solvent extracted. And more fatty fish like salmon is important too. People living in the south of Australia are thirty-two percent more vulnerable that those whose homes are in the north. This isn't new information; people living in the far northern European and American states are also more vulnerable to multiple sclerosis. Whilst medicine would advise taking vitamin D pills, in chiropractic we advise a regular walk in the sun, with a hat, and more shellfish; especially if you live far from the equator. We say this because walking and vitamin D are vital for the body for a host of reasons, not just to prevent multiple sclerosis. There are many neurological conditions other than multiple sclerosis that cause tingling in arms and hands and feet and face. And seafood contains the vital omega-3 fatty acids too, so essential for reducing inflammation in all the body and not just the nerves. For another interesting and informative page about tingling in arms and hands at another site, see below; it's about the serious repercussions of a diet too low in the healthy oils. Fat, that is, the right kind, is absolutely vital for sparkling good well-being. You can read more about vitamin D in this mussel facts page. In general we should all be enjoying these phytochemical foods on a daily basis, but particularly those suffering from sign of an irritated nervous system; the oleocanthal in olive oil, for example, is a powerful natural anti-inflammatory. Google appears to frown on too many links, so phrases in bold, like that oleocanthal above, and foods to reduce inflammation below, need to be put into the Site Search function in the navigation bar on your left if you want more information. Heart attack and tingling in the left arm. Tingling in the finger tips, the toes and around the mouth suggest the need for a test for a condition called hypoparathyroidism; it's causes low calcium and many serious complications, including osteoporosis. See more at our best calcium for osteoporosis page; taking it in pill form is now discouraged as it raises the rate of heart disease. 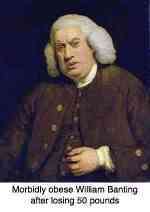 The development of a tremor in the hands, more usually in fact in just one, is disturbing and needs to be followed up. The most usual cause is what used to be called benign essential tremor syndrome although today the prefix is usually dropped as it develops in about 20% of cases into something more serious. If you have tingling in arms and hands as well as a tremor then you should certainly consult a neurologist. There is no known cause of BETS although some cases are familial. An 'essential' tremor occurs with an intentional movement, whereas the more serious Parkinson's syndrome produces a 'resting' tremor. There is strong research that fava beans may be used to produce a steady supply of L-dopa more satisfactorily than the medication. If you are serious about fava beans nutrition, as I am as I too suffer from benign essential tremor syndrome, then you must grow them yourself, or find a local farmer; they must be young and freshly picked. We call them by their other name, broad beans. Chiropractic has a role to play in all these conditions causing tingling in arms and hands, even perhaps multiple sclerosis, though there's no known cure for MS.
Correcting subluxations in the neck and ribs, spine and pelvis which are the primary cause of these "paresthesias" is fundamental to the successful management of these conditions. A "cure" is not always possible, but medicine doesn't claim that either. Penned more than 15 years before the first website.